And so here I ask the question again, another genocide? It hasn’t quite reached that point but thousands of people are being and have been displaced in the Democratic Republic of Congo. 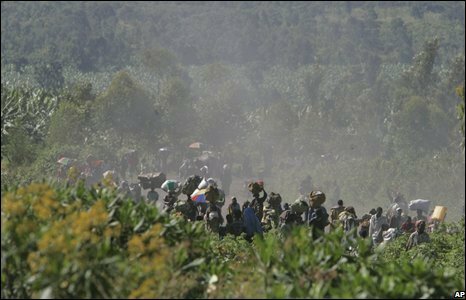 The Hutu’s and Tutsi’s did not find peace years ago and the renewed fighting has not only displaced thousands from their homes but even their refugee camps. Well what is it now? What do we do? What can I do? I feel so helpless. I can pray, yes, I can pray for we know that the prayer of a righteous man is strong and powerful. James 5:16 “The effective, fervent prayer of a righteous man avails much.” And so I shall pray, pray for peace, pray for the people who are starving, fearful, homeless, sick, hurt, traumatized, angry…and all the things that are direct and indirect consequences of war and displacement. But yet, I am strong, healthy, stable (relatively I suppose) and just sitting here reading the news as though there is no tomorrow. But what bothers me is for some there isn’t. I know I am sounding pessimistic and doubting of God’s ability to change situations or his sovereignty, but my little human mind struggles when I see so many suffering, and I am just here. Is there something I can do aside from praying? Should I do something aside from prayer? Or is it just my heart that is beating an extra beat per minute and not a call to leave and go. But what could I do anyway? I have no real medical background? I don’t speak the language? Would I just get in the way, would I break down, or would I be strong? Here I am thinking as if I really would go. I don’t know. I wish I was a hero or something and I could fly over there just like that. When will this terrific madness stop? When will mankind stop being mankind? I have had at times some foolish belief that mankind is inherently good. But we aren’t. We like to believe that we are but we are not. But what about those people? I wonder how they see the world, see life, see liberty, freedom, justice? I wonder how they see God? Today I heard a poem about Africa and it was beautiful. The imagery, the feelings, the emotions of our great continent, the history, the beauty, the earth. But yet, why is it that such a place as this is so cursed by war and struggles? When will we know peace? So I ask thee Lord, come Lord Jesus come…! !